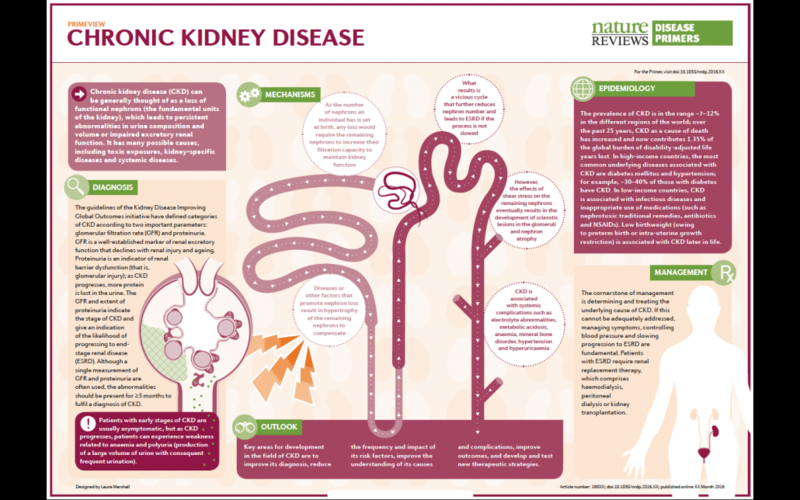 Our partner Prof Dr Hans-Achim Anders of Ludwig-Maximilians-Universitaet Muenchen has coordinated a new publication in Nature Reviews ‘Disease Primers’ on Chronic Kidney Disease (CKD). Contributing authors are Paola Romagnani, Giuseppe Remuzzi, Richard Glassock, Adeera Levin, Kitty J. Jager, Marcello Tonelli, Ziad Massy, Christoph Wanner and Hans-Joachim Anders. Abstract: Chronic kidney disease (CKD) is defined by persistent urine abnormalities, structural abnormalities or impaired excretory renal function suggestive of a loss of functional nephrons. The majority of patients with CKD are at risk of accelerated cardiovascular disease and death. For those who progress to end-stage renal disease, the limited accessibility to renal replacement therapy is a problem in many parts of the world. Risk factors for the development and progression of CKD include low nephron number at birth, nephron loss due to increasing age and acute or chronic kidney injuries caused by toxic exposures or diseases (for example, obesity and type 2 diabetes mellitus). The management of patients with CKD is focused on early detection or prevention, treatment of the underlying cause (if possible) to curb progression and attention to secondary processes that contribute to ongoing nephron loss. Blood pressure control, inhibition of the renin-angiotensin system and disease-specific interventions are the cornerstones of therapy. CKD complications such as anaemia, metabolic acidosis and secondary hyperparathyroidism affect cardiovascular health and quality of life and require diagnosis and treatment.